Knowing the mathematical odds of the dice achieving a certain outcome is the essence of the game. If you are going to play for money, then try and remember these odds. 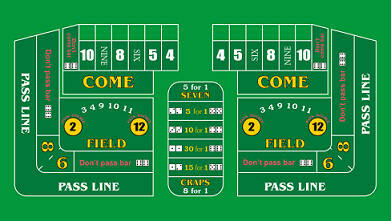 For a description of the kind of bets you can make playing Craps, see instructions from a real casino or dice-play's Craps guide. If you want to understand more about how odds work, see dice odds. You will be at a slight disadvantage with the Pass Line bet since the odds of the dice winning are only 970 times out of 1980. The edge against the dice passing works out as 1.414%. The following table illustrates the bets found on Vegas/Nevada, Atlantic City, etc., Bank Craps tables. Bets in red can be made in other ways at better odds. British casinos are tightly regulated and pay better odds on some bets. The following table illustrates the differing bets found in British casinos. Bar 1-2 Some greedy casinos (on cruise ships perhaps) bar 1-2 and not 1-1 or 6-6. This gives them a greater edge on Don't Pass/Don't Come bets. There are 36 possible outcomes of two dice. The following tables show the true odds for the specified outcome of the dice. (A) This column gives the number of possible ways of making the dice total. (B) This column gives the odds against making the dice total in a single roll. (C) This column gives the odds against rolling the dice total before a 7. (D) These columns give the odds against making the higher dice total before the lower dice total. e.g. 12 before 6 = 5 - 1. For making the lower number before the higher, reverse the odds. e.g. 6 before 12 = 1 - 5. Hardway Odds of making a number as a double, before a 7 or as another combination.